Habitat is the global conference on cities and human settlements organized every 20 years by the United Nations (UN). Habitat III, the 3rd conference took place in Quito (Ecuador) in October 2016, with the topic 'sustainable urbanization'. We, as the Committe on culture of UCLG, participated in this major international meeting. You can follow the messages that were exchanged and disseminated during the event in this storify. 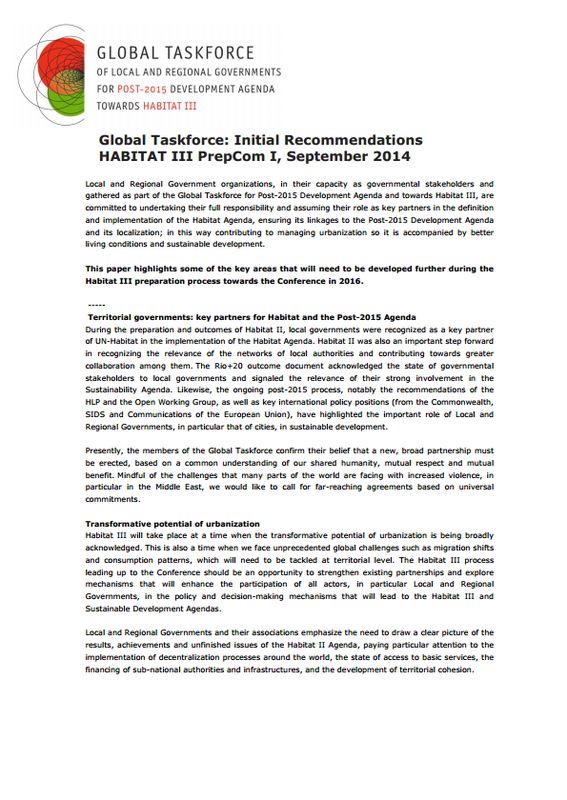 Previously, three meetings of the Preparatory Committee of Habitat III (PREP COM) took place in New York (September 2014), in Nairobi (April 2015) and in Surabaya (July 2016). Our former President, Catherine Cullen, participated in these meetings. 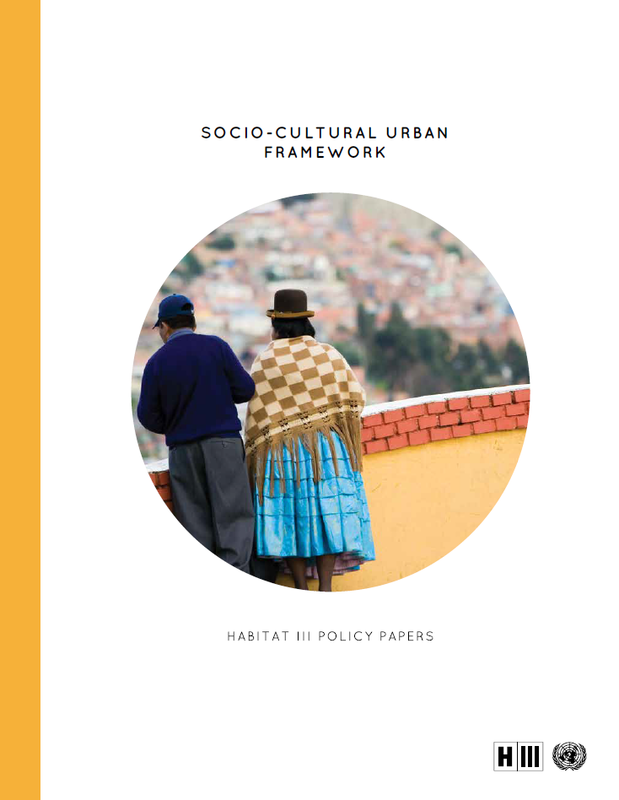 In September 2014, Recommendations made by the Global Taskforce of Local and Regional Governments for Post-2015 Development Agenda towards Habitat III in this context include "Culture as a driver and enabler of sustainable development" as a key policy area. 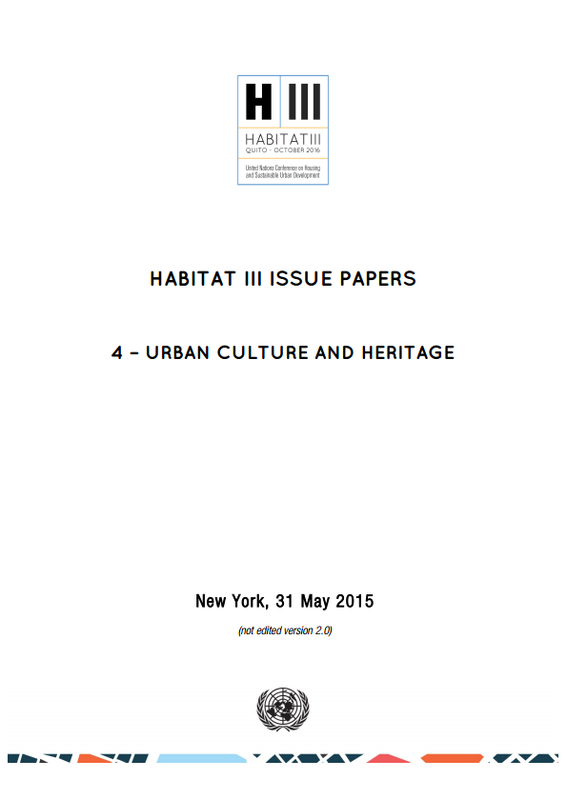 In the framework of preparations for Habitat III, the UN Task Team had published 22 issue papers, as summary documents on a range of areas related to housing and sustainable development. Among these is an issue paper on "Urban Culture and Heritage". Following the publication of these issue papers, a series of online "Urban Dialogues" was launched in July 2015. 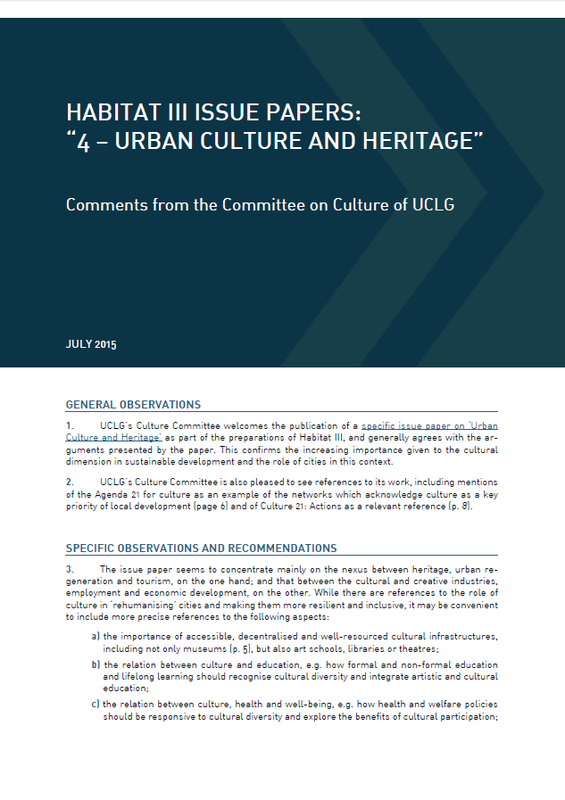 In this context, the UCLG Committee on Culture has formulated a set of comments to the issue paper on "Urban Culture and Heritage", which you can also find below. The Committee welcomed the publication of this paper and believes that the new Urban Agenda should provide details of a culture-based approach to local sustainable development. Finally, in January-march 2017, the Secretariat of Habitat III convened several Policy Units, composed by 20 experts each, bringing together individual experts from a variety of fields, including academia, government, civil society and other regional and international bodies. 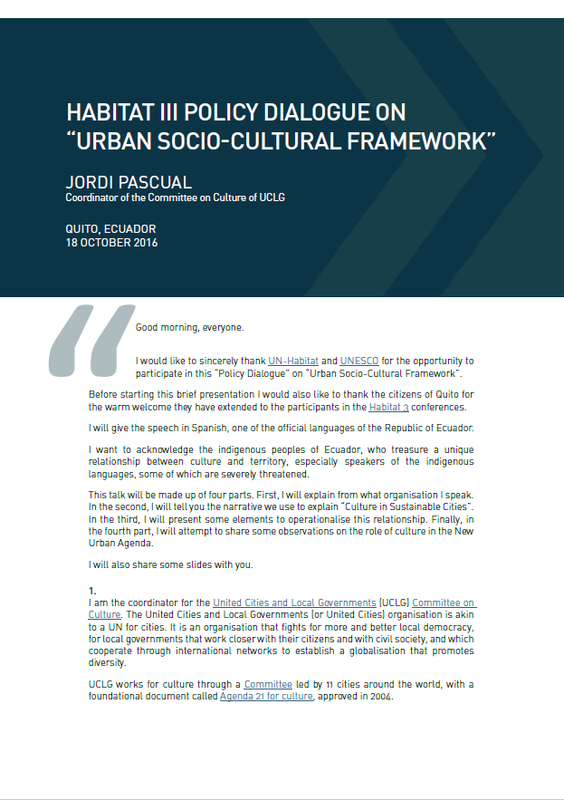 The coordinator of the UCLG Committee on culture, Jordi Pascual, was a member of the Policy Unit 2. The final policy paper entitled "Sociocultural urban frameworks", prepared by the members of this Policy Unit, was distributed in the PrepCom III (July 2016). 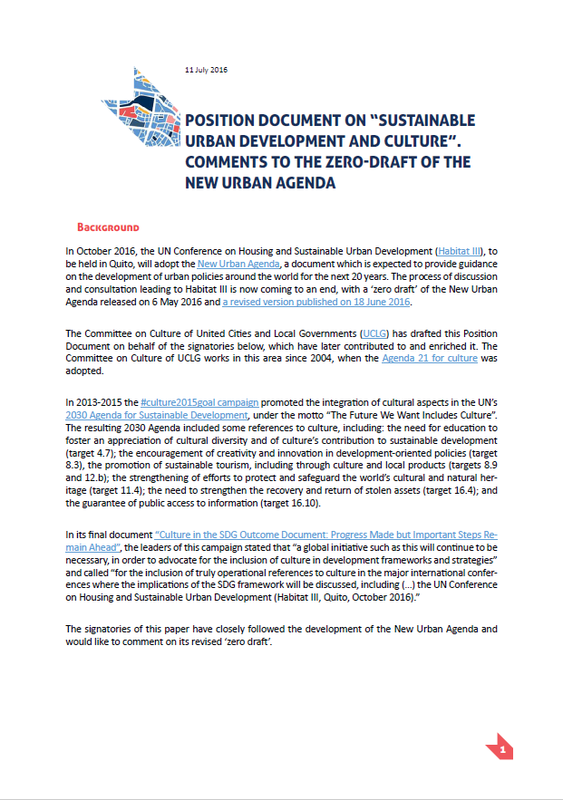 The comments of the Committee on culture of UCLG, together with 7 other global cultural networks, to the zero-draft of the New Urban Agenda to be presented during the Habitat III Conference in Quito in October 2016. 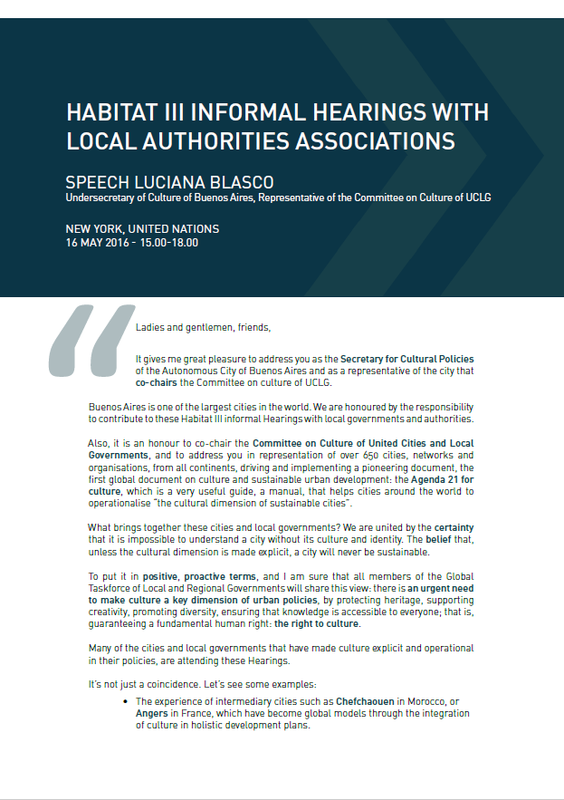 The speech of Luciana Blasco, the undersecretary of Culture of Buenos Aires, and Representative of the Committee on Culture of UCLG, during the Informal hearings with local authorities associations for the preparation of the New Urban Agenda of Habitat III. New York, May 2016. The speech of Jordi Pascual, Coordinator of the Committee on culture of UCLG, during the Habitat III Policy Dialogue on "urban socio-cultural framework". Quito, October 2016.